There are large queues to shop in cites and towns across Venezuela. But it is more in hope than expectancy. From toilet paper to beer there is a shortage in the country of everything. That includes food which is sold at subsidised prices. It is an economic meltdown. The people are ready to, “explode” opposition leaders have warned. “We still have not found a place where we can get rice, pasta, butter, anything so we can give our kids something to eat. I am tired of it. How is it possible that they have us in this situation and they don’t give any kind of information regarding the fact there isn’t any food for us to take home,” explained Caracas resident Maria Hernandez. “The queues are tremendous, we have never seen this before. I have never seen them the way they are now and the worst thing is that we can’t even get our hands on milk for the babies who are having a worse time of it,” added another resident Placida Delgado. The fractured economy and shortage of essentials is linked to oil which accounts for over 90 percent of Venezuela’s export revenues. As the prices of crude took a nosedive the country with the world’s largest reserves was hit hard. The figures behind the economy make chilling reading. GDP suffered a fall of 3.9 percent in 2014, 5.7 percent in 2015. The country’s industrial base has suffered. In 1999 there were 13,000 companies in 2016 that number had fallen to 4,000. And then there is inflation. It is the highest in the Latin American continent 141.5 percent in 2014 reaching 180.9 percent last year with the IMF predicting a record 700 percent for this year. Reaction on the streets has included a rise in incidents of looting. 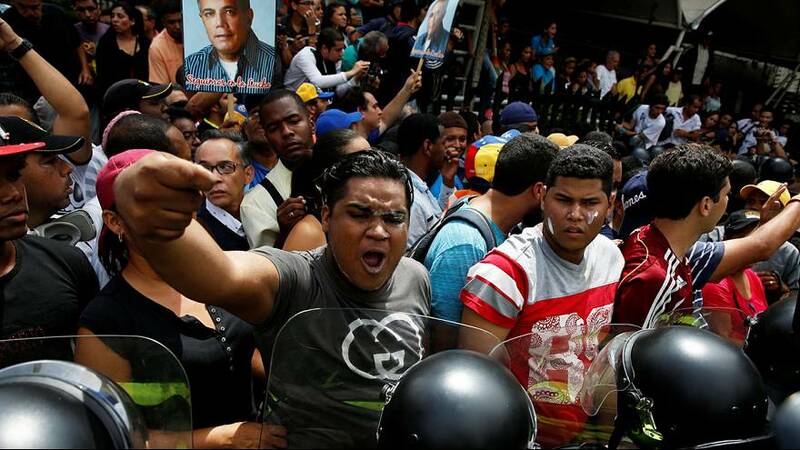 Security had to be tightened in the country’s second largest city Maracaibo. Authorities reported looting of various shops and pharmacies and the burning of some vehicles. The scenes were repeated in several other cities. President Nicolas Maduro who has blamed an international conspiracy on the problems has seen his approval rating crash. Seventy percent want him gone. “I decree, today, Friday 13th of May a state of economic emergency in order to defend the country.. Here is the decree signed and approved for the protection of our country,” he declared to his cabinet. The president’s standoff with the oppostion has been accentuated since it made moves to initiate a referendum to annul his presidency. The opposition claims to have delivered a petition of 1.85 million signatures to the country’s elections authority – well in excess of the 200,000 needed for the next phase of a recall referendum against Maduro.